Margareta Brahe was a Swedish noblewoman who through marriage became a Landgravine of Hesse-Homburg. Margareta Brahe both by birth and due to her three marriages belonged to the social, economic and political elite of a powerful Sweden. She led an active life at the Swedish royal court as well as spending a lot of time in continental Europe in company of her first two husbands, who were official functionaries and diplomats, and as the wife of Landgrave Fredrik of Hessen-Homburg. Margareta Brahe was born at Rydboholm castle, north of Stockholm. Her mother was Baroness Elsa Gyllenstierna of Lundholm, who was a descendant of an ancient noble family. Her mother’s ancestors included women who had held prominent positions at the royal court, and men who had held high-ranking official roles or posts. Margareta Brahe’s father, Baron Abraham Brahe, was a member of the “riksråd” (council of the realm, or Privy Council). During the 1620s he was one of the most notable political authorities in Sweden. Margareta Brahe was a lady-in-waiting at the royal court during the 1620s and up to the point of her first marriage in 1633. She was Queen Maria Eleonora’s chief lady-in-waiting, which at the time was the most eminent post a woman could hold at the royal court. She accompanied the queen on her travels in Sweden, and to Germany, and she appears to have been well-liked by Maria Eleonora. The role of chief lady-in-waiting apparently had no political significance as it seems that Maria Eleonora had little political influence on her husband. In 1633 Margareta Brahe married Bengt Oxenstierna of Eka and Lindö. After a brief period spent in Sweden, Bengt Oxenstierna was appointed Governor-General of Livonia, and thus the couple settled in Riga. Little is known of Margareta Brahe’s main occupations during this period, but her letters reveal that she longed to return to Sweden. It was not until her husband’s death in 1643 that Margareta Brahe did return to Sweden and to her role at the royal court, albeit this time as chief lady-in-waiting for Queen Kristina. Margareta Brahe lived at the royal castle in Stockholm. Letters written to Margareta Brahe at this time reveal that people believed she had some influence over the queen. Margareta Brahe received several letters of petition asking her to talk to the queen on matters such as royal appointments. In 1648 Margareta Brahe married Count Johan Oxenstierna of Södermöre, who was the son of the Chancellor Axel Oxenstierna. As she had not had any children in her first marriage, and was at this point already 45 years old, her future father-in-law initially opposed the marriage. One of the reasons he had for this was that his son, Johan, who also had not had any children in his own first marriage, would thus remain childless. Another reason for opposing the marriage was that Johan Oxenstierna risked losing the considerable inheritance he was set to gain from his extremely wealthy mother-in-law by remarrying. That did not end up being the case. Margareta Brahe’s marriage with Johan Oxenstierna appears to have been a loving one which lasted until Johan’s death in 1657. The couple lived in Sweden from time to time, although shortly after they married they moved to Germany where Johan Oxenstierna served as one of the Swedish negotiators for the peace treaty following the end of the Thirty Years’ War. He was known for being short-tempered and aggressive. As he himself admitted in a letter to his father, Margareta Brahe apparently had a good influence on him. Margareta Brahe was widowed for the second time when she was 54 years old. By this time she was extremely wealthy and her relations hoped she would remain unmarried and thus leave a large inheritance behind for them. Although she was quite poorly herself, Margareta Brahe determined to marry for a third time. She was being courted by two men, both of the highest social standing. One was Count Ludvig Henrik of Nassau-Dilberg, the other was Landgrave Fredrik of Hessen-Homburg. The former was 66 years old, a widower of three previous marriages who had many children. The latter was only 27 years old and a former officer of the Swedish army. He had lost one of his legs through active service. Margaret settled on the younger suitor. Despite serious opposition from her family, particularly with regard to the significant age gap between the two of them, Margareta Brahe married Fredrik of Hessen-Homburg in 1661. However, this decision came to haunt Margareta Brahe. Ludvig Henrik of Nassau-Dilburg, who believed he had received a promise of marriage from her, began to spread rumours in Germany that she had broken their engagement. At the time such an accusation was a serious matter and Margareta Brahe suffered the repercussions of it for many years. Eventually a resolution in the matter was achieved. From 1661 until her death in 1669 she lived in Germany with her third husband, Fredrik of Hessen-Homburg. Margareta Brahe appears to have been an independent person who made a certain number of controversial choices in her life, but who also followed the conventions of the day. Her second and third marriages both met with disapproval yet they were also conventional in the sense that she married either within or above her own social ranking. Margareta Brahe died in 1669. Following her death Margareta Brahe generated discord amongst her Swedish dependents as it was revealed that a great part of her wealth had been made-over to her third husband. Her grave lies in the Brahe funerary vault which lies under the family tomb at Jäder church. It was erected on Margareta Brahe’s orders. 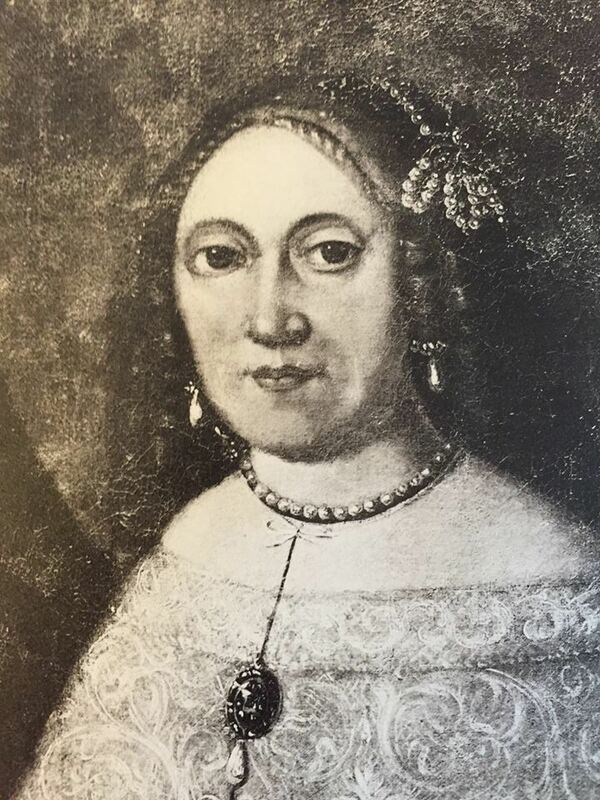 Margareta Brahe, www.skbl.se/sv/artikel/MargaretaBrahe, Svenskt kvinnobiografiskt lexikon (article by Svante Norrhem), retrieved 2019-04-20.